“How would you celebrate the opening of the Calgary Airport’s new runway?” That was the question the Calgary Airport Authority wanted to ask Calgarians before the grand opening June 2014. But how do you get your question out there, create buzz and crowdsource ideas? Usually we recommend calling Strut. Working with the event organizer Brookline Public Relations, we built a microsite (YYCRunway.com) that would play host to their “30 Days, 300 Ideas” campaign, run throughout November 2013. Users submitted and shared suggestions on their favourite ways to celebrate the launch. The fully-responsive website featured automatically-ingested social media posts from the Calgary International Airport’s Twitter and Facebook feeds and let site administrators manually update and change site content. The website formed a hub for conversations around the project, displayed galleries of construction and milestone images, and provided key facts and information about the runway’s economic and logistic benefits. In total, more than 380 ideas came in from all over the city which resulted in the “Run and Roam the Runway” event on June 14 and 15, 2014. This weekend event incorporated a number of ideas from the online campaign and gave the public a once-in-a-lifetime opportunity to celebrate the completion of the Calgary airport’s newest landing strip. 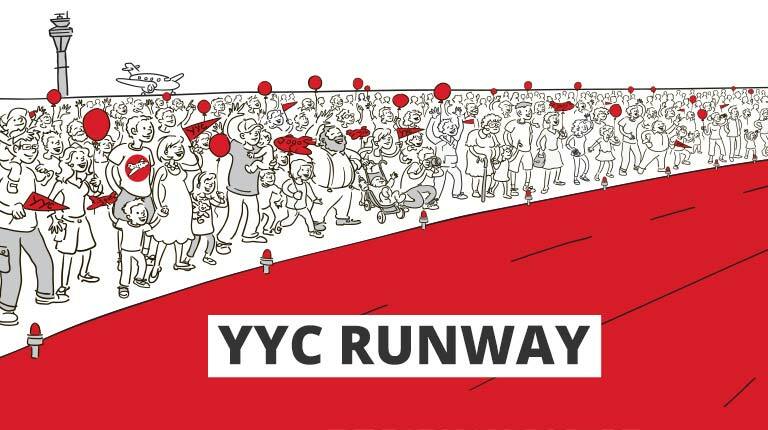 A mobile-friendly website that marks this achievement for the Calgary International Airport and encourages public engagement by crowdsourcing ideas for the runway launch event.